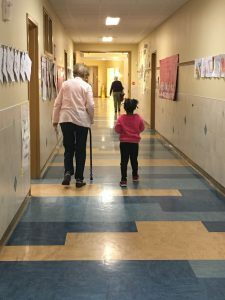 “One class of first graders is filled with students at such varying academic levels, this presents a lot of challenges. How can one teacher address all these needs? It’s just so much work!” says Sylvie Montello, community coordinator at Ocean Avenue Elementary. To address this dilemma Starting Strong worked with teachers and schools to identify a group of students who could benefit from extra supports to achieve reading benchmarks and piloted a program called Reading Partners. 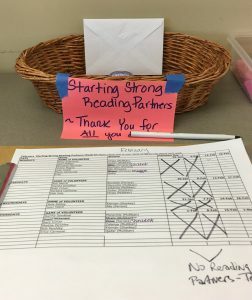 Three years later, Reading Partners continues to expand within Ocean Avenue Elementary and beyond to other Portland schools. Reading Partners pairs a community volunteer with a first grade student identified by their teacher to be reading below benchmark. 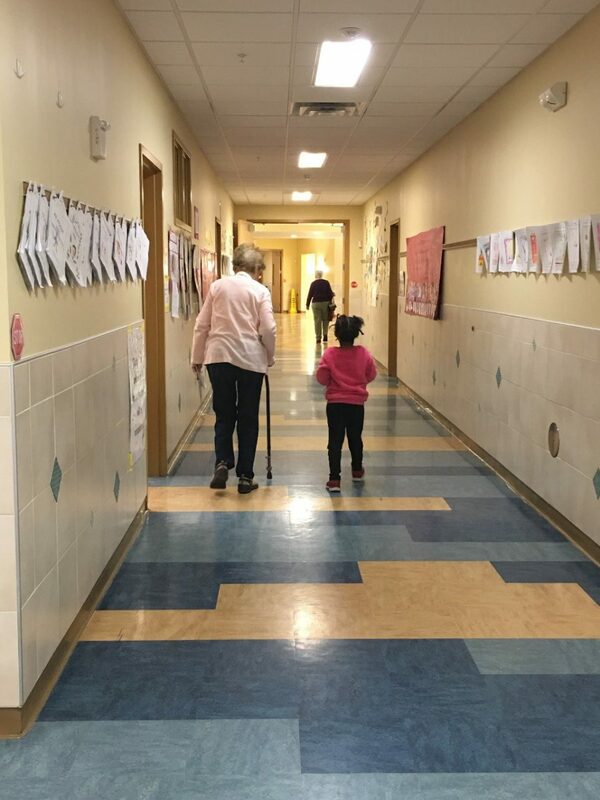 Through weekly 25 minute sessions with their volunteer, the student receives extra support to help them reach grade level reading and join the class again. Since the beginning of the program, Beth has worked relentlessly to see it succeed. When reflecting on the importance of the program she notes, not only does this time improve a student’s reading level, it helps “their self-esteem and they begin engaging in their classroom.” She reflects on one student the first year who struggled with behavior issues in class alongside reading problems. Mid-year his teacher noticed improvements in his behavior, and that he was participating more in class, making big academic gains. Stories like this one are not uncommon from the program. According to Beth, teachers repeatedly report back positive results on the students’ reading level as well as their behavior and enthusiasm in class. “It works. It makes a difference and is helping young students reach a level of proficiency” says Sylvie after reflecting on the past three years of the program. 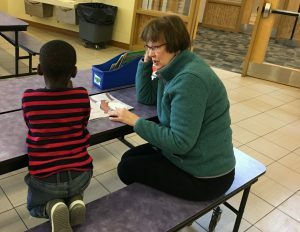 The students are the purpose and focus of the program but Reading Partners also leads to the development of a strong network of enthusiastic, engaged volunteers who love to rally around the student and the school in general. Beth and Sylvie both note a change in the regular volunteers who feel a “great sense of pride in the work” and “are seen as part of the school community.” The majority of these volunteers continue to return year after year. With the help of staff, Reading Partners volunteers feel supported and capable of helping these students reach greater academic success. Demonstrating achievement of grade-level reading along with increased confidence in the classroom for the student and creating a sense of community and pride for the volunteer, Starting Strong Reading Partners has developed into an invaluable program in several Portland Public Schools. Thank you to all the hard working staff and volunteers! If you are interested in volunteering as a partner, please contact Stephanie Nicoson at (207)874-1000 x2330 or snicoson@unitedwaygp.org.